Although planning a cross-country flight can seem like a daunting task, choosing a destination is easy—for the most part. Much of the time, pilots choose to fly to the airports with the best restaurants and the best service. There are some other things to consider, though. As a student, you'll likely have certain lesson requirements to accomplish. You may need to fly to more than one airport or at least 150 nautical miles. Or your instructor might want you to practice in different types of airspace environments, and he might send you to an uncontrolled airfield first and then to a busier towered airport later. Make sure the lesson objectives are being met, and then you can perhaps squeeze in some practice time during the flight. Another thing to keep in mind is the services at your destination. Make sure fuel is available if you need it. And once you have a destination in mind, get a weather briefing and NOTAMs before you continue to ensure you won't run into bad weather or a closed runway. Choose a route that will allow you to fly at a safe optimum altitude for your aircraft while still allowing you to easily identify checkpoints on the ground. If you're going to navigate with the help of instruments, you can choose routes that go to and from VORs. If you fly a small airplane, you might not be able to climb high enough to fly over a mountain range and your only option might be to go around it. Be aware of terrain, military operations areas and temporary flight restrictions (TFRs) when you plan your route. And make use of the VFR routes that go in and out of busy airports—that's what they're there for. Choose checkpoints that are 5-10 nautical miles apart and are easy to identify. Lakes, rivers, towns and other airports are usually easy to spot. Over very flat land with less-than-ideal checkpoints, you might need to fly an indirect route to make sure you don't get lost. It's important to stay aware of your position at all times, so don't be afraid to plan a deviation from the straight-line path in order to find your way. Once you choose your route, plot it out on a VFR sectional map. There are a variety of different ways you can obtain weather information. The first and possibly most popular option is to call the flight service station. Calling the number 1-800-WX-BRIEF will put you in touch with an air traffic control specialist that is FAA-certified as a Pilot Weather Briefer. This is especially helpful if you need assistance translating weather codes or if you have questions about the weather. The second option is to use CSC DUATS or DTC DUATS, each of which offers FAA-approved weather information. DUATS systems offer an abundance of weather information, flight planning tools and the option to file a flight plan. Finally, pilots can use any of the widely-used sources for weather information, as long as they can be considered reliable. An individual person's weather blog may not be the most reliable source, for example. Stick to NOAA, airport weather observation reports, and pilot reports. You'll want to fly high enough to maintain the required clearance from terrain and obstacles, of course, but you'll want to consider aircraft performance and the ability to find checkpoints from the air, as well. The performance charts in the pilot operating handbook or pilot information manual for your aircraft can help you determine an altitude and cruise power setting to use to get the best range or best endurance. You'll need to complete the speed, distance, and time for each leg of the flight, as well as fuel consumption. It's easiest to follow a navigation log form for this. You can do it by hand (with the help of a flight computer) or use a trusted computer or iPad application like ForeFlight. If you're a student, your instructor will probably require you to be able to do all of the calculations by hand. Using a navigation log can help you organize the calculations in a way that makes sense and is easy to use. 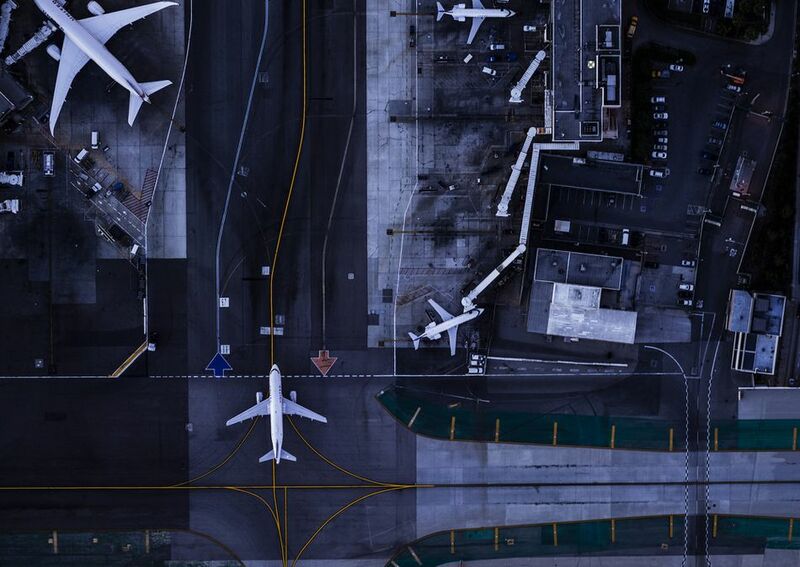 If you've ever been stuck at a busy airport without an airport diagram, then you know that it's imperative to keep your situational awareness even after you land. If you're unfamiliar with them, large airports can be challenging. Taxi instructions can be lengthy and you'll want to know what you're doing when you're surrounded by Boeing 737s and MD-80s. Besides getting familiar with the airport layout, you should know which FBO to use and the hours of operation. You'll want to make sure fuel and other services are available if and when you need them. Besides, you'll probably need a restroom. If you're reliant on certain navigational instruments, make sure they work. Ensure the GPS database is up to date and working, and make sure the VOT check has been done to ensure the VOR system is reliable. Make sure you are equipped with survival gear, appropriate clothing for the weather, flashlights, charts, and water. And don't forget to charge your iPad. For most, it takes a few hours to get everything prepared for a cross-country flight. Weather can change quickly and airports can close unexpectedly, so be sure to call the flight service station for an abbreviated briefing. If the winds have changed, you may want to make a few adjustments to your speed and time calculations before you depart. After you get your weather briefing from the flight service specialist, you'll want to file a flight plan. Filing a flight plan with the flight service station adds a layer of safety; if you don't show up to close the flight plan, and you can't otherwise be found at your destination, search and rescue will be alerted—which means you'll need to remember to close your flight plan when you arrive safely! A flight plan makes cross-country flying a breeze. But as everyone knows, sometimes things don't go as planned. Be prepared mentally to adjust your plans as necessary. If the winds are stronger than predicted, you might need to adjust your calculations en route and even update the flight service specialist with a new estimated time of arrival. If your VOR fails, you might need to rely more heavily on your map reading skills. And if the weather deteriorates, you may need to divert to a different airport. If you plan for the unexpected, you'll be ready for anything.